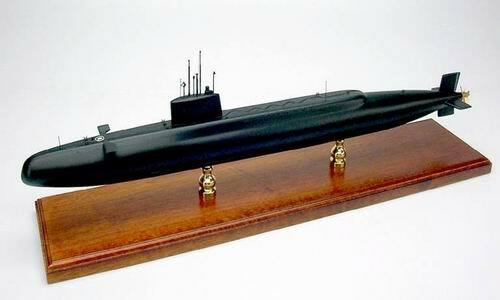 A missile platform was required by the United Kingdom for an effective deterrent during the cold war and in September 1966 HMS Resolution was launched, Britains's first SSBN or missile carrying nuclear powered submarine. Displacement was 8,500 tons with a loa of 425 feet and an underwater speed of 25 kts. The Polaris missiles were made in the USA but with UK built and designed warheads and guidance systems. Adoption of the Polaris missile was considered a requirement following cancellation of the vulnerable Skybolt V Bomber launched missile system. Two boats were built by Vickers at Barrow and these were HMS Resolution and HMS Repulse. Two more were built by Cammell Laird Shipbuilders at Birkenhead and these were HMS Renown and HMS Revenge. The planned fifth boat of the class was cancelled by the Labour government in 1967. Despite this, the class carried out 229 patrols in a 28 year service pattern and the final patrol was undertaken in 1996. Mahogany Wood. Scale: 1/192. Length 26 1/2 inches.